My Life in the Charente: Part 2 of our trip to Barcelona. The Cathedral and the Defence Walls. Part 2 of our trip to Barcelona. The Cathedral and the Defence Walls. 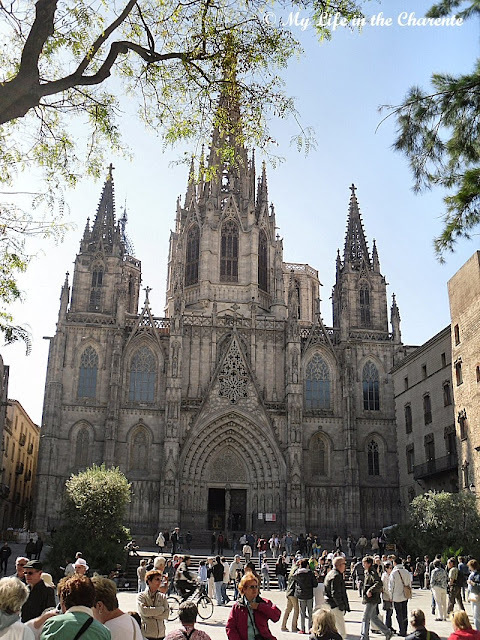 The Cathedral of the Holy Cross and Saint Eulalia, also known as the Barcelona Cathedral and commonly known as La Seu, can be found not far from La Rambla. 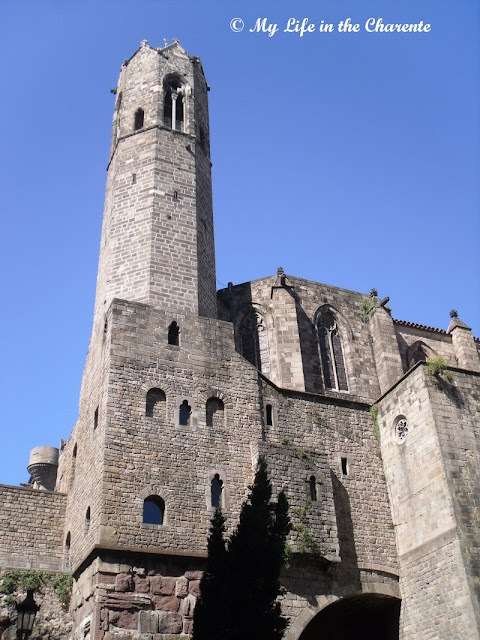 (see photo below) This church, with its beautiful façade, should not be confused with the spectacular Sagrada Família, about which I will be writing in Part 3! 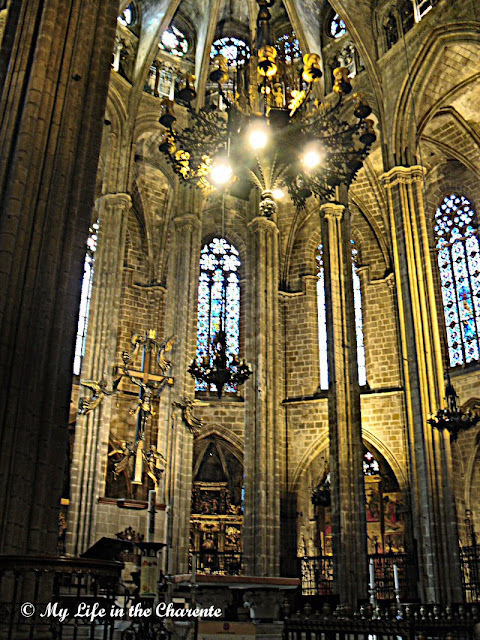 This Gothic style cathedral is the seat of the Archbishop of Barcelona. The cathedral was built between the 13th and 15th centuries, most of the work being done in the 14th century. There is a lot of information Here if you would like to read further. It appears that opening hours are mornings and evenings only, so make sure about this if you should want to see inside! Various views of the inside below. Below are two photos of what remains of part of the Roman city wall and the buildings later built on top of it by the Spanish. The sign by this building below reads:- "The Roman wall and defence towers from the second enclosing wall of Barcino (4th century AD). 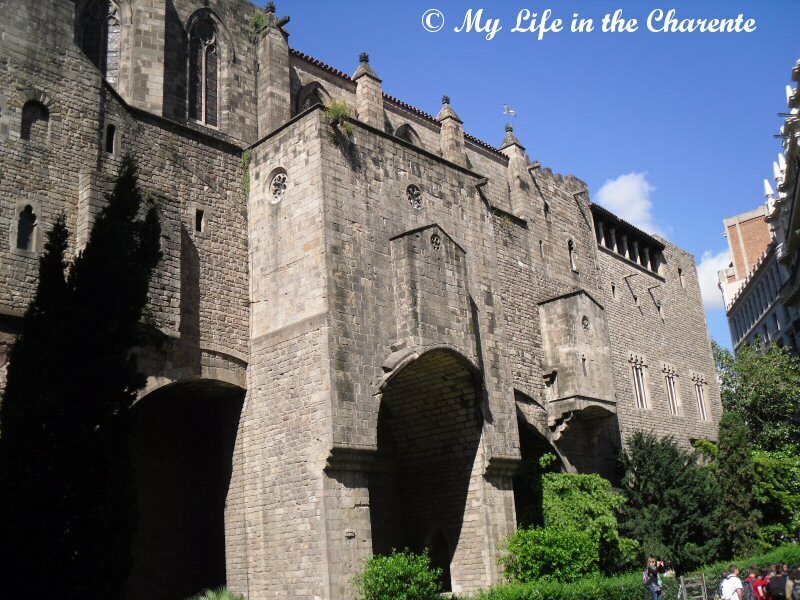 The buildings that are conserved on this section of the wall are the Royal Chapel of Santa Agata and the Royal Palace (14th century)"
Moving quickly on to dining out, a popular activity in the city, the seafood platter on our second night in Barcelona was a feast for the eyes before we even had one mouthful! As a coastal Mediterranean city, Barcelona offers great choices of fresh fish and seafood. There is a multiplicity of restaurants throughout the city centre specialising in all sorts of cuisine; it seems that almost every other building provides a site for a restaurant or café! 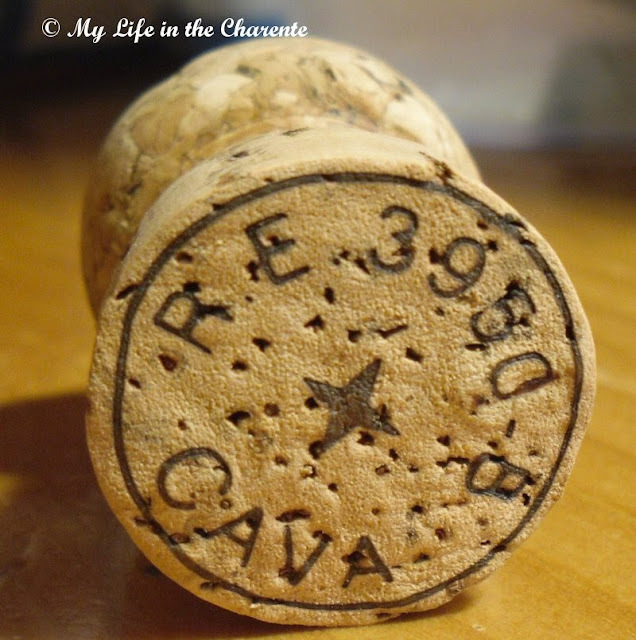 We got hooked on Cava (Spanish sparkling wine) in the three days we were there and drank little else with our evening meals. It goes so well with tapas (Spanish snacks) and with seafood. Really quite delicious! We are busy redecorating at home, having just had new oak double glazed windows installed. We have nothing standard size, so all the frames had to be hand made! Installation has been a major exercise for our two local artisans, as the old frames were built into the walls and had to be chipped out, necessitating areas of new plasterwork. If I do not visit you for a bit, please understand that after attending to the house and the garden, there is little spare time left at present! Wow, so much history and great food and drink. Glad you had a great time. Trips are not only visual, and Barcelona sure is photogenic, but the food really amazing! Spanish tapas are so good and the ambiance wonderful in the streets and restaurants. What a lovely trip you had (I have to stop writing as I am running out of adjectives. Ok one more! magnifico! i must find some cava and try it! new windows...what fun! or not!!! i should have had the windows replaced here long ago. now i must replace them before i sell it. what a headache! 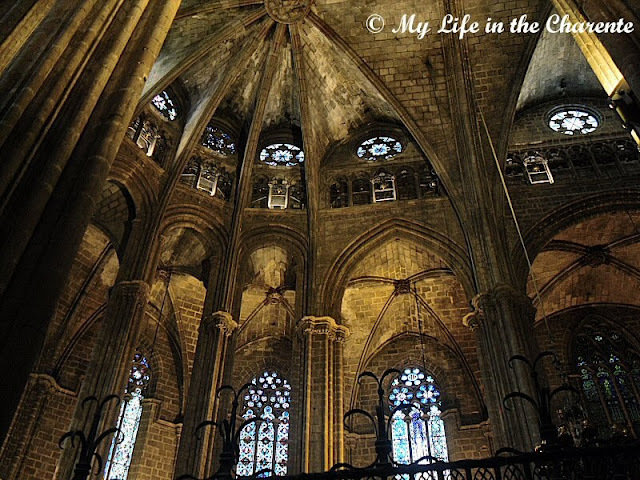 The gothic cathedral is simply stunning. I could really get to enjoy a variety of fish in dining places around those parts. Lucky you (?) 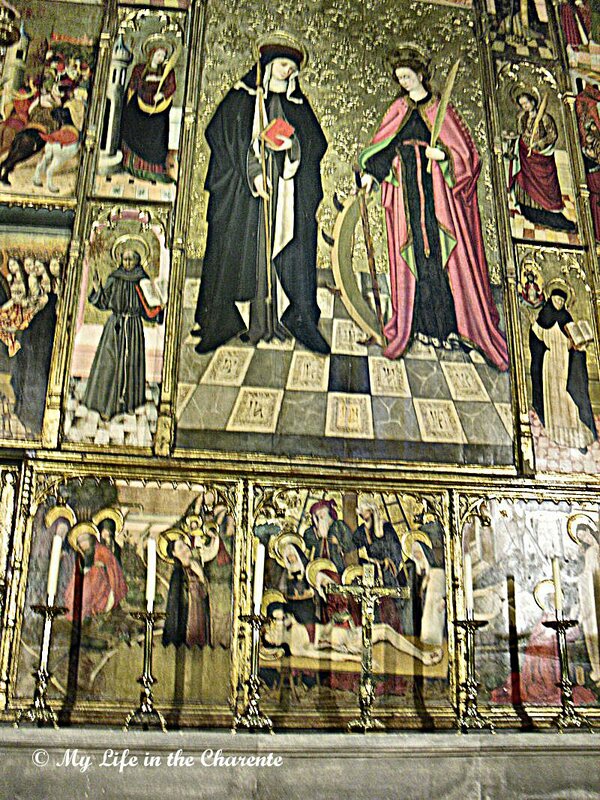 for redecorating. I haven't gotten around to doing anything about my plans for the same. That church is superb and seems like it should be in a fairytale. You have been keeping very busy since returning from your travels with guests and now more remodeling. I'm sure your taking photos of the current project to share with us later. The church is stunningly beautiful. I agree about seafood in Barcelona - it's one of the great pleasures of visiting. I hate to admit it but I prefer cava to champagne. Not just because it's less expensive but I like the taste and for some reason it doesn't give me a headache. How good to see the photographs of old Barcelona...and thanks for the link. I am enjoying the sheer delight of the seafood here in Spain at the moment - making the most of it before returning home! 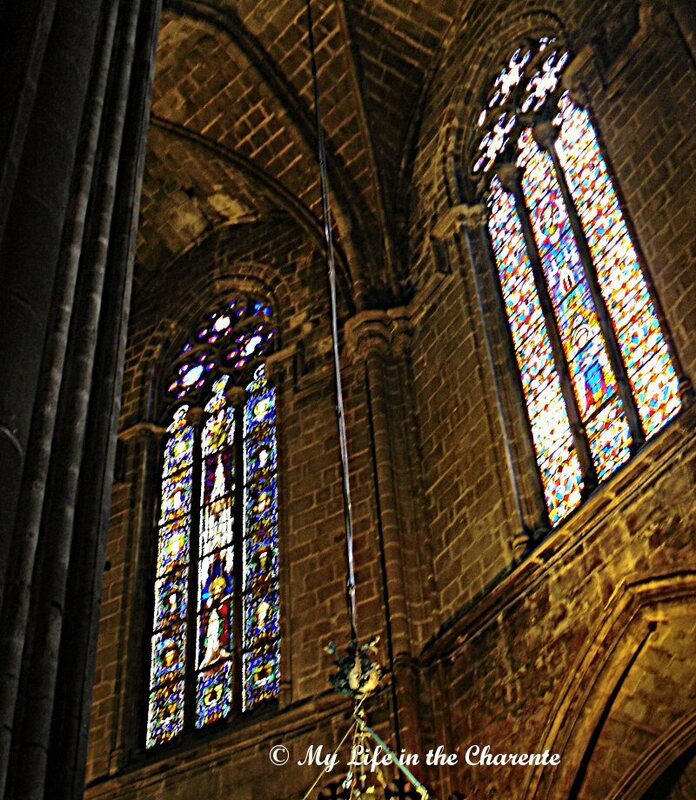 Love the photos of La Seu and the old walls - spectacular ... then your fish dish - looks exceedingly tasty and that glass of Cava ..
Have fun with all the decorating and oak glazed windows - bet they'll make a difference in a few months ..
Hilary if you could see how many cork we have that is just another one to add to the boxful! I have made dozens of notice boards with corks but you can only use so many and there is not a ready market for them. What a magnificent cathedral. 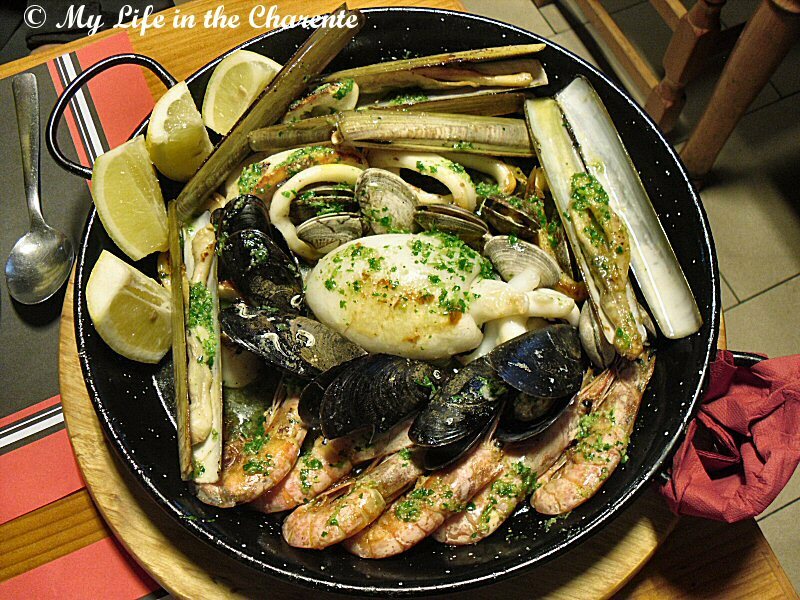 The abundance of seafood and being able to sip Cava throughout the trip sounds very appealing. Amazing photos. That cathedral is stunning! The seafood dish looks scrumptious too. What a cathedral! Barcelona sounds great and I'd love to go there. I can imagine all the good restaurants. Your dinner does look like a feast! Good luck with your windows, that's quite an undertaking with them having to be hand made. I'm back to blogging now and playing catch-up. Have a great rest of the week, Diane! The façade of the cathedral is just magnificent. We got to see many of the sights when we were there last October but weren't there long enough to really explore the Barcelona food scene. So I guess we will have to return ... soon. My house is undoubtedly not as old as yours, yet to have our windows replaced would be a massively expensive nightmare. Happily for us, the previous owner had custom storm windows built and fitted to the outside of all of our windows, so the inside windows remain solid. 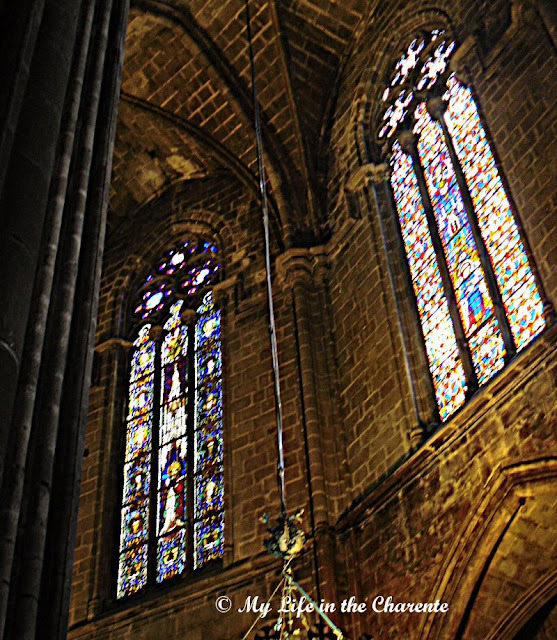 I'm sure you would be enjoying yourself more if you were still in Barcelona visiting those magnificent cathedrals, but it's a certainty that you will enjoy the lowered drafts which the new windows will afford you next winter! Dear Diane, I am glad that you are having a nice time in Barcelona. The food looks wonderful! 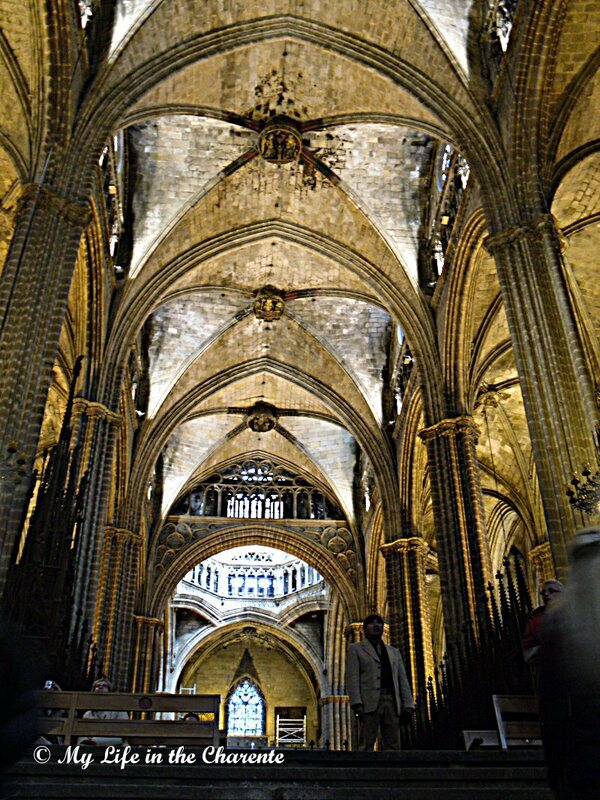 The cathedral is magnificent! It is amazing how these structures were built so long ago without modern equipment and built so well and with so much character. Thats what the Mediterranean is all about ... seafood platters. :) This was such a great trip Diane. Thanks for sharing it all with us as it is places most of us will never see otherwise. I enjoyed this trip with you too. The seafood looks delicious and the cathedral majestic. We are painting the interior of our house and spreading mulch. I understand your search for time. We just do a little each day. Cava and tapas - that's a combination that would suit me down to the ground. I know what you mean about things in the house not being a standard size. I don't think I've ever lived anywhere with standard sizes. I suppose someone must live in a standard house somewhere. Maybe I'm just unlucky. I think the seafood is my favourite pic!! LOL! I love Spain and spanish people, it is such a lively country... I guess from what I see that you had much fun! Noushaka if we could eat like that every night we would, but a bit expensive I am afraid for seafood all the time here. Keep well Diane. Thanks, it was a pleasure to visit Barcelona with you. Barcelona is high up on the list of places I want to go to. That chocolate cake..... wow and yummy! and good luck with the redecorating.